Detail, care, authenticity and traceability a Sresta promise. Buying 24 Mantra from Sresta means you are a votary of the healthy, nutritious movement. Like our farmers and us, you have decided to keep the planet in a sustainable state. Reduce the chemicals and pesticides, keep the air and water clean and of course keep the soil alive. From our end, we are monitoring the organic methods and assuring from seed to kitchen, every detail is given the attention it deserves. 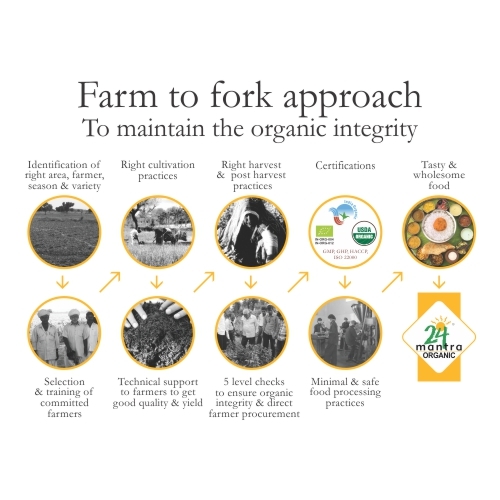 Actually, our practices stem from our values and beliefs – adhering to organic integrity, earning your trust and creating a sustainable platform for our farmer friends. Every crop and food has its soil and climate determined by nature. Like cotton needs black soil, so also the range of crops our farmers grow. We ensure quality by choosing the right seed, soil and climate. In fact, our emphasis is on taking maximum advantage of the varied agro climatic zones and produce crops that are native to the particular place and also take into consideration that it will yield quality produce. Farms ideal for organic farming are seldom available. We first pick an area where the contamination level is low. And then the farm. Choosing the right farm is therefore the first practice we learnt to adopt. Our team, when a farm is shown first examines scientifically the level of contamination in the soil and water. Our micromanagement techniques ensure we even examine the wind drift or water flowing from the neighboring farms that would impact the organic purity. Typically, we start with a few farmers and gradually scale up the area over a period of time. It takes a minimum of 3 to 4 years for the soil to be fit enough for organic farming and ensuring pesticide free food for the consumer. An organic farmer generally has a natural predisposition to old fashioned goodness with a firm belief in Mother Earth. They recognize the need to nurture it. They know an earth well looked after means they will be in turn be looked after by it. Working with farmers with the right attitude, right values have been the cornerstones of our dedicated relationship with 45,000 farmers across 15 States of India. We encourage farmers to use their own seeds scientifically and use varieties which have the best taste, flavor and good productivity. We also work with seed companies to develop seeds suitable for organic agriculture. The seeds should not have any genetically modified organisms (GMOs). We think and believe that GMOs tinker with nature at a very fundamental level and the consequences on humans, animals, plant & the environment are not known and hence not safe. All our seeds are GMO free. 60 years of green revolution has ensured the soil is denuded of its native riches. Soils have progressively grown nutrient poor. It is a known fact that high yields happen when there are high nutrient levels in soil. The cornerstone of our farming approach is to build soil fertility and restore natural balance. We ensure our farmers adopt crop rotation practices and use diversity of crops effectively. We discourage monoculture where repeated cycles of the same crop or set of crops only strengthens the pest and disease complex. Pest and disease load goes up in monoculture. Rotation of crops restores soil fertility and the natural balance. Farmers generate their own manure and uses of farm pest control methods are based on locally available plants and if necessary use Bio agents (natural enemies of pests & diseases). Our practices have successfully led to improving the carbon content in the soil from meager levels of less than 0.5%. We train farmers to do it through manuring. We train them to use a variety of on farm material to generate compost and vermicomposting (composting using earthworms). What earthworms can do man cannot! In addition, growing legumes and other crops also ensures the reinvigoration of the soil and support microbes. All in all a fertile Mother Earth for bountiful crops. Controlling pests requires a lot more hard work for an organic farmer. We encourage only natural methods and multiplication of natural enemies of pests and disease causing organisms.. Local and home grown techniques and ideas mesh in with our accumulated experience in different soil and climatic areas. Neem, seeds, custard apple, tulasi leaves, ginger, garlic, chilli crushed and sprayed is one chosen technique. Mixing protein rich dals and flours in the water and continuous aeration ensures rapid multiplication of beneficial microorganisms and release of valuable nutrients into the soil. Spraying of panchakavya made with ghee, jaggery, coconut milk etc., is a common practice to enhance the quality and yields. To ensure higher productivity in organic foods, we address the twin areas of bio-control and the raw material. Pest and disease control is done by reintroducing the natural enemies into the field. For example entmo pathogenic nematodes into the soil to curb root grub. Fungal agents to protect the seeds, keep the soil healthy and foster natural plant growth. Bio control companies are engaged for supply of bio-fertilisers which help in making available nutrients to the plants form the soil.. Apart from this, is our ongoing dialogue and partnering with seed companies to give organic, naturally grown seeds suited for organic cultivation. In our experience, we have observed that organic practices in a 3-year cycle can bring down pest and diseases even upto 60%. Proper storage and processing to preserve nutrition, flavor, aroma and taste are the key foundations. This has been a learning experience where we discovered contamination could happen in the processing. In fact, contamination could happen anywhere across the production chain. We store our produce in environmentally controlled warehouses. These warehouses have a well ordered and proven monitoring system. Use of botanical preparations, pheromone traps and other such ingenious techniques ensure the infestation is controlled. We have developed safe, chemical free modified atmosphere techniques to prevent pest infestation in storage. Everything we check. Land, water, air, even the farmer’s attitude towards food and agriculture. Know them all. Farmers are bonded into small organic groups. These small groups with a combination of self-adherence, social control and supervision ensure that the conversion of farmer into an organic farmer is complete. Takes up to 4 years to realize this commitment. Our Field Officers visit every farm 2 – 3 times in a month. They check adherence, provide timely solutions that facilitate the farming methods and sustain the purity of the crop. Randomly selected teams conduct a well laid out inspection process which in turn ensures objectivity. Contamination from other fields, adherence to processes and the larger picture of maintaining organic integrity are evaluated. We check twice a year. 30,000 inspections in a year. Certification Agencies do their checks 2 – 3 times a year. They check everything – farmer, soil, water and the produce sample. We do a pesticide residue check before the crop is certified as pure and 24 Mantra Organic. Random samples are taken from the farmers’ produce and tested on field with need-based lab checks.